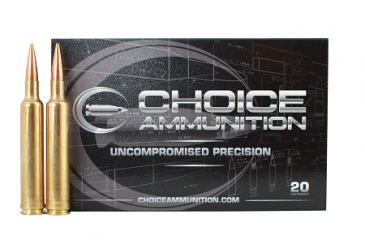 6.5-300 Weatherby Magnum 130 Grain Nosler AccuBond- The 6.5-300 Weatherby Magnum is a 6.5mm cartridge created by Weatherby in 2016 as its own rendition to the ever-growing 6.5mm long range rifle market. Named the 6.5-300 Weatherby Magnum, the new hot-rod round is simply the .300 Weatherby Magnum necked down to 6.5mm (0.264 inch). As the newest in Weatherby’s lineup this cartridge is designed to be in direct competition to the 26 Nosler and Claimed by Weatherby to be the fastest 6.5mm cartridge available. Designed in a similar fashion as other Weatherby cartridges it has a large for caliber case capacity resulting in high velocities. When bullets with high ballistic coefficients are used trajectories are extremely flat, allowing the projectile to retain a significant amount of energy downrange. These attributes make the 6.5-300 quite effective for long range hunting on medium-sized game. Our 100% Hand-Loaded 130 grain Nosler AccuBond rounds are loaded with extremely tight tolerances, producing highly accurate, consistent and reliable performance with each and every shot! Our proprietary load formulas and loading process create the finest round of ammunition available on the commercial market today we feel. If you don’t load your own ammunition- let us do it for you! 6.5-300 Weatherby Magnum 140 Grain Berger VLD-Hunting- The 6.5-300 Weatherby Magnum is a 6.5mm cartridge created by Weatherby in 2016 as its own rendition to the ever-growing 6.5mm long range rifle market. Named the 6.5-300 Weatherby Magnum, the new hot-rod round is simply the .300 Weatherby Magnum necked down to 6.5mm (0.264 inch). As the newest in Weatherby’s lineup this cartridge is designed to be in direct competition to the 26 Nosler and Claimed by Weatherby to be the fastest 6.5mm cartridge available. Designed in a similar fashion as other Weatherby cartridges it has a large for caliber case capacity resulting in high velocities. When bullets with high ballistic coefficients are used trajectories are extremely flat, allowing the projectile to retain a significant amount of energy downrange. These attributes make the 6.5-300 quite effective for long range hunting on medium-sized game. Our 100% Hand-Loaded 140 Grain Berger VLD-Hunting rounds are loaded with extremely tight tolerances, producing highly accurate, consistent and reliable performance with each and every shot! 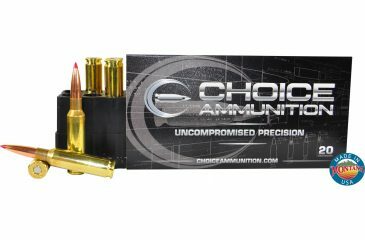 Our proprietary load formulas and loading process create the finest round of ammunition available on the commercial market today we feel. If you don’t load your own ammunition- let us do it for you! 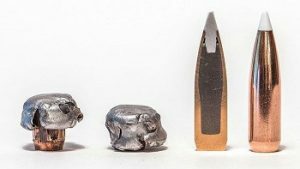 6.5-300 Weatherby Magnum 140 Grain Nosler AccuBond- The 6.5-300 Weatherby Magnum is a 6.5mm cartridge created by Weatherby in 2016 as its own rendition to the ever-growing 6.5mm long range rifle market. Named the 6.5-300 Weatherby Magnum, the new hot-rod round is simply the .300 Weatherby Magnum necked down to 6.5mm (0.264 inch). As the newest in Weatherby’s lineup this cartridge is designed to be in direct competition to the 26 Nosler and Claimed by Weatherby to be the fastest 6.5mm cartridge available. Designed in a similar fashion as other Weatherby cartridges it has a large for caliber case capacity resulting in high velocities. When bullets with high ballistic coefficients are used trajectories are extremely flat, allowing the projectile to retain a significant amount of energy downrange. These attributes make the 6.5-300 quite effective for long range hunting on medium-sized game. Our 100% Hand-Loaded 140 grain Nosler AccuBond rounds are loaded with extremely tight tolerances, producing highly accurate, consistent and reliable performance with each and every shot! 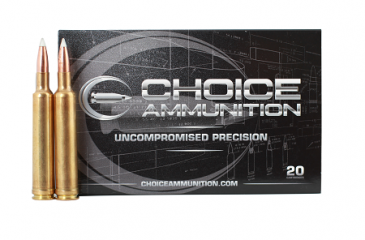 Our proprietary load formulas and loading process create the finest round of ammunition available on the commercial market today we feel. If you don’t load your own ammunition- let us do it for you! 6.5-300 Weatherby Magnum 143 Hornady ELD-X- The 6.5-300 Weatherby Magnum is a 6.5mm cartridge created by Weatherby in 2016 as its own rendition to the ever-growing 6.5mm long range rifle market. Named the 6.5-300 Weatherby Magnum, the new hot-rod round is simply the .300 Weatherby Magnum necked down to 6.5mm (0.264 inch). As the newest in Weatherby’s lineup this cartridge is designed to be in direct competition to the 26 Nosler and Claimed by Weatherby to be the fastest 6.5mm cartridge available. Designed in a similar fashion as other Weatherby cartridges it has a large for caliber case capacity resulting in high velocities. When bullets with high ballistic coefficients are used trajectories are extremely flat, allowing the projectile to retain a significant amount of energy downrange. These attributes make the 6.5-300 quite effective for long range hunting on medium-sized game. Our 100% Hand-Loaded 143 Hornady ELD-X rounds are loaded with extremely tight tolerances, producing highly accurate, consistent and reliable performance with each and every shot! Our proprietary load formulas and loading process create the finest round of ammunition available on the commercial market today we feel. If you don’t load your own ammunition- let us do it for you!